Arctic Indigenous scholars have historically and continue to advance a variety of issues, such as food security, hunting and fishing rights, community resilience, climate change, biodiversity, and a number of other topics and disciplines. The information and understanding put forward by such scholars is invaluable. It is increasingly clear that the study of the Arctic depends upon successfully empowering Arctic Indigenous scholars with the opportunity to provide insight and expertise to those scientists studying the Arctic within the realm of academic research, often from urban-based settings. The objective of this opportunity, led by the Arctic Research Consortium of the U.S. (ARCUS) and the Inuit Circumpolar Council (ICC) Alaska, and supported by the National Science Foundation's Division of Arctic Sciences, is to create a space for Indigenous scholars to educate and inform policy- and decision-makers engaged in Arctic Issues from the nation's capital, Washington, D.C. Funding for this program is provided to ARCUS by the National Science Foundation's Division of Arctic Sciences (PLR-1304316). The application period for 2020 Arctic Indigenous Scholars, if funded, will open in December 2019. For any questions regarding the project or application process, please contact Lisa Sheffield Guy at lisa [at] arcus.org or 907-474-1600. 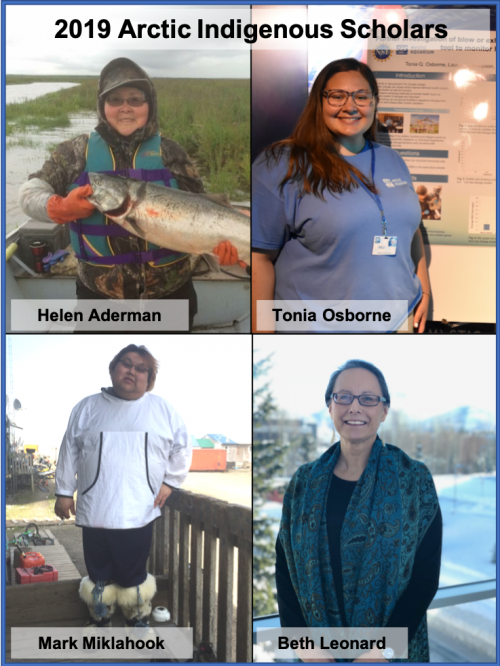 Congratulations to the four Arctic Indigenous Scholars selected in 2019! The scholars will travel to Washington, D.C. in May, 2019 where they will provide a seminar/webinar as part of the ARCUS Arctic Research Seminar Series and meet with with D.C. area officials relevant to their interests and community needs. Helen Kegginarrluk Aderman is Yup’ik born in Togiak, Alaska, from Aleknagik, Alaska. She is the Bristol Bay Native Association’s Marine Mammal Manager, based in Dillingham, and the Executive Director of the Qayassiq Walrus Commission and Bristol Bay Marine Mammal Council. She holds a B.A. in Rural Development from University of Alaska Fairbanks. Helen is working to address impacts on marine mammal habitat use areas and to ensure future Alaska Native generations will have continued access to their traditional marine foods for harvest. 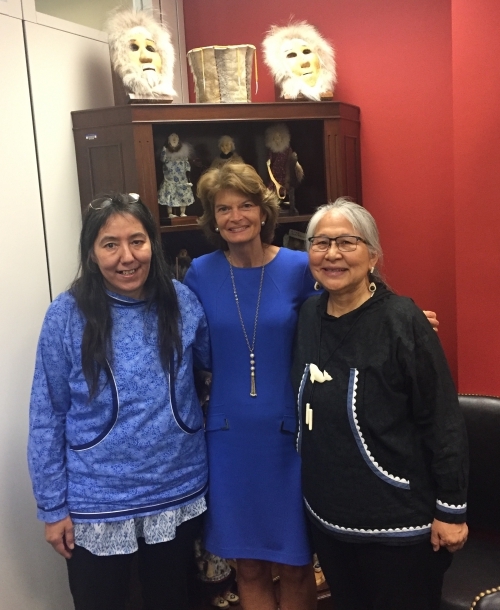 While in D.C., Helen hopes to work with federal stakeholders on resolving unique remote Alaska Native issues in establishing long-term marine ecosystem habitat protective measures. Beth Ginondidoy Leonard is professor and director of the Alaska Native Studies Program at the University of Alaska Anchorage. She is Deg Xit’an (Athabascan) and member of the Shageluk Tribe of interior Alaska; her parents are James, and the late Jean Dementi. In 2014, she was awarded a Fulbright U.S. Core Scholarship and spent five months at Te Kawa a Māui – School of Māori Studies at Victoria University of Wellington (VUW). During that time, she taught a joint University of Alaska-VUW videoconference with Dr. Ocean Mercier, and researched Māori student recruitment, retention, and mentoring. 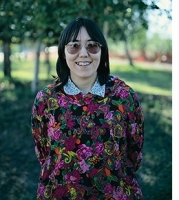 Beth is a member of the Alaska Native Studies Council, and UArctic Indigenous Issues Committee. Her current research investigates the confluences of Indigenous methodologies, knowledges, and pedagogies in shaping Indigenous spaces in higher education. Mark Sivukrak Miklahook, III is St. Lawrence Island/Siberian Yupik from Savoonga, Alaska in the Bering Strait. As an Arctic Indigenous scholar, Mark hopes to address the importance of teaching Native Alaskan languages in village schools, how his community uses traditional food to continue their subsistence traditions, and how climate change is shortening winters and affecting hunting/subsistence activities. He is actively engaged in efforts to improve his community, such as the Alaska Community Action on Toxins, the Bering Sea Women’s Group, and volunteering with the Alaska Rural Veterinary Clinic. Mark will use this opportunity to represent the voice of the Siberian Yupik people of St. Lawrence Island, who are often underrepresented in government discussions and policy decisions that are made in Washington D.C.
Tonia Qanannaq Osborne is Inupiaq from the village of White Mountain, Alaska but she also grew up in Nome. She is a senior at the University of Alaska Southeast in Juneau where she is studying marine biology. Tonia is an Alaska Native Science and Engineering Program (ANSEP) university success student as well as a Caleb Pungowiyi Scholar. As an undergraduate, she is very involved with research with marine mammals through an REU (Research Experience for Undergraduates) program at Mystic Aquarium. Tonia will continue to do research with her university until she graduates. She is very interested in incorporating traditional knowledge from hunters, villagers, and elders in scientific research as the Arctic is experiencing amplified effects of climate change. Congratulations to the two Indigenous scholars for 2018 selected by our five-member volunteer selection committee, Rosemary Ahtuangaruak and Theresa Arevgaq John! We received many excellent applications for this opportunity and hope to continue it in the future. Theresa and Rosemary traveled to Washington D.C. in May 2018 where they met with leaders and policy-makers to discuss issues important to their communities. We are grateful to those who took time to meet with the scholars, including: The National Science Foundation, the Environmental Protection Agency - Office of International and Tribal Affairs, The Department of State offices of International Health & Biodefense and Environment & Global Change, The Smithsonian Institution's Arctic Studies Center, Senator Lisa Murkowski and staff, The National Institute of Environmental Health Sciences, and the Department of Interior for hosting a multi-agency meeting at their headquarters. Rosemary will also provide a seminar as part of the ARCUS Arctic Research Seminar Series in the near future. Helen Wiggins, Executive Director, Arctic Research Consortium of the U.S.
Lisa Sheffield Guy, Project Manager, Arctic Research Consortium of the U.S.
Raychelle Daniel, The Pew Charitable Trusts, Washington, D.C.
Alicia Bell-Sheeter, USDA Forest Service Office of Tribal Relations, Washington D.C.